Nicolas Poussin (1594–1665), Landscape during a Thunderstorm with Pyramus and Thisbe (1651), oil on canvas, 192.5 × 273.5 cm, Städel, Frankfurt am Main. Wikimedia Commons. 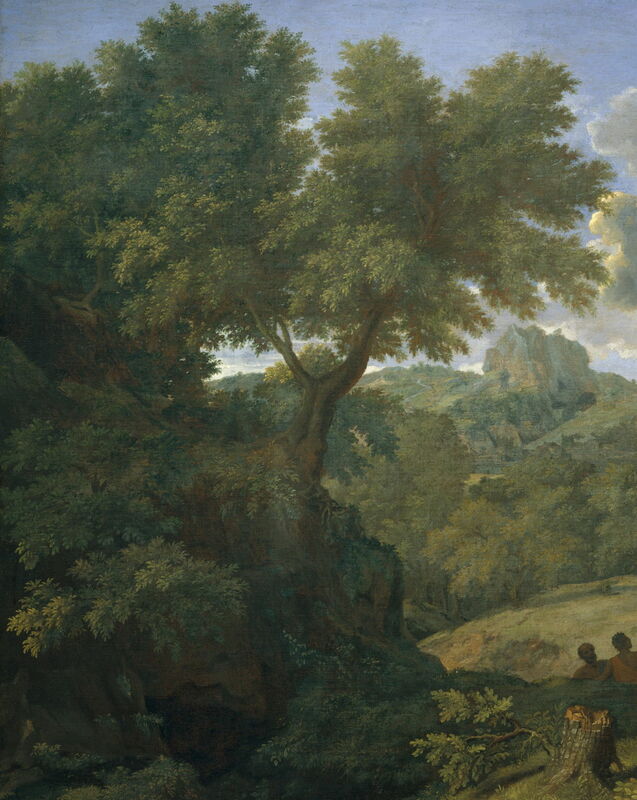 As one of the founding fathers of the genre, Poussin’s landscapes invariably incorporate narrative, and are usually rich in trees too. Trees often frame his views in repoussoir, but seldom dominate his motifs. Few landscape painters since have not been deeply influenced by his pioneering paintings. Nicolas Poussin (1594-1665) was born near Les Andelys, a village on the River Seine in Normandy, where he was initially apprenticed to Quentin Varin. He ran away to Paris at the age of eighteen, where he continued his apprenticeship under minor masters. Becoming impressed by Italian paintings, he attempted to travel to Rome, but was forced to return to Paris. He eventually moved to Rome in 1624, and remained there painting for most of the rest of his life. A good friend of the other major French landscape painter of the day, Claude Lorraine, he relied mainly on private patronage and completed many major paintings with religious and historic themes. He returned to France between 1640 and 1642 to work as court painter to Louis XIII. He returned to Rome as a result of intrigues in the French court, and his work then became increasingly dominated by landscapes. After 1650 painting became more difficult because of worsening tremor in his hands, but this did not stop him completing a quartet of the Four Seasons between 1660 and 1664. 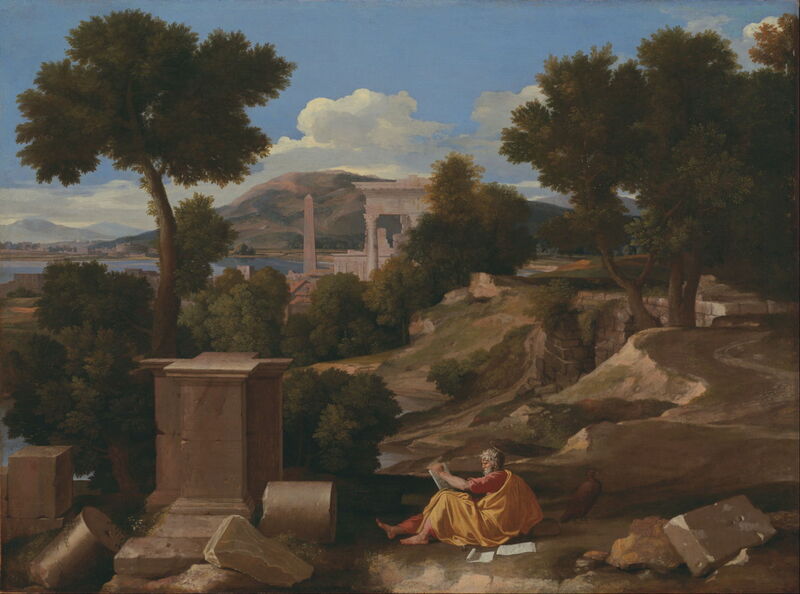 His marriage was childless, but he adopted his wife’s brother, Gaspard Dughet, who painted fine landscapes and assumed the name of Poussin; distinguishing the work of Nicolas Poussin from that of Gaspard Dughet remains difficult and controversial. 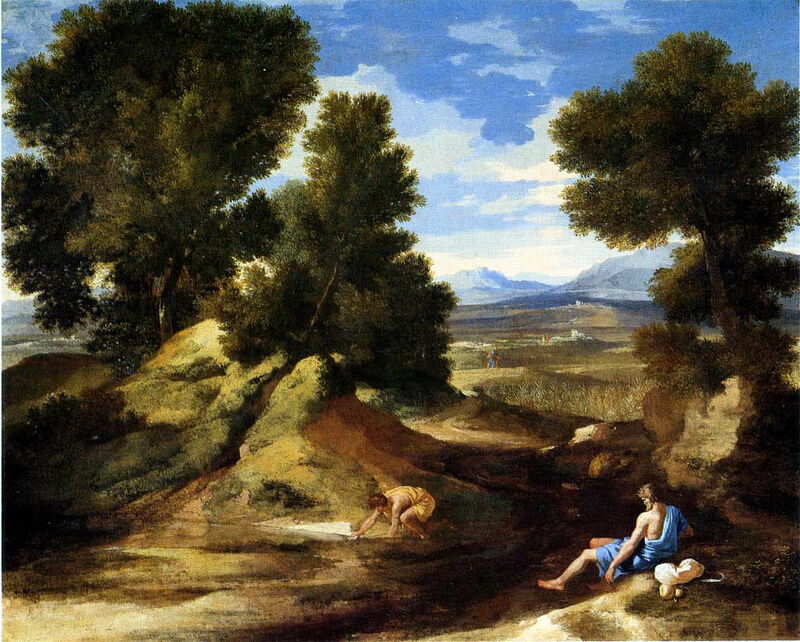 Nicolas Poussin (1594–1665), Landscape with a Man Drinking, or Landscape with a Man Scooping Water from a Stream (c 1637), oil on canvas, 63 x 77.7 cm, The National Gallery, London. Wikimedia Commons. In Landscape with a Man Scooping Water from a Stream (c 1637) he comes closest to a view dominated by trees, most probably his lifelong favourite, oaks, in this case the Holm Oak, Quercus ilex. Each is carefully constructed from the trunk and branch anatomy, and their canopies, although dense, are clearly formed from leaves rather than solid masses. The distant view is that of an idealised Roman campagna. Nicolas Poussin (1594–1665), The Sacrament of Ordination (Christ Presenting the Keys to Saint Peter) (c 1636-40), oil on canvas, 95.9 × 121.6 cm, Kimbell Art Museum, Fort Worth, TX. Wikimedia Commons. 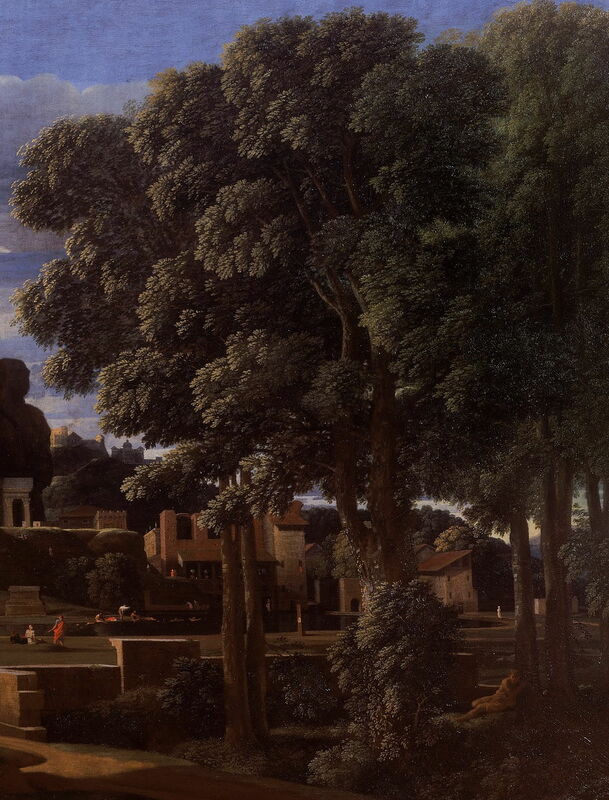 His early works were mostly religious, myth, and history, but he still took the opportunity to enrich landscape backgrounds with carefully painted trees: this, one of his first series of seven paintings showing the sacraments, was completed for Cassiano dal Pozzi, a major patron in Rome. The Sacrament of Ordination (Christ Presenting the Keys to Saint Peter) (c 1636-40) is interesting as its trees, although far less colourful than Christ and his disciples, dominate in size. Nicolas Poussin (1594–1665), The Sacrament of Ordination (Christ Presenting the Keys to Saint Peter) (detail) (c 1636-40), oil on canvas, 95.9 × 121.6 cm, Kimbell Art Museum, Fort Worth, TX. Wikimedia Commons. Seen close up, Poussin has shown closer foliage in crisp detail, and softened that as it goes deeper towards the background: this is remarkable, as it mimics the effects of optical depth of focus, something which he could not have known about. He also modelled variation in colour and texture of the bark, and other subtle details. 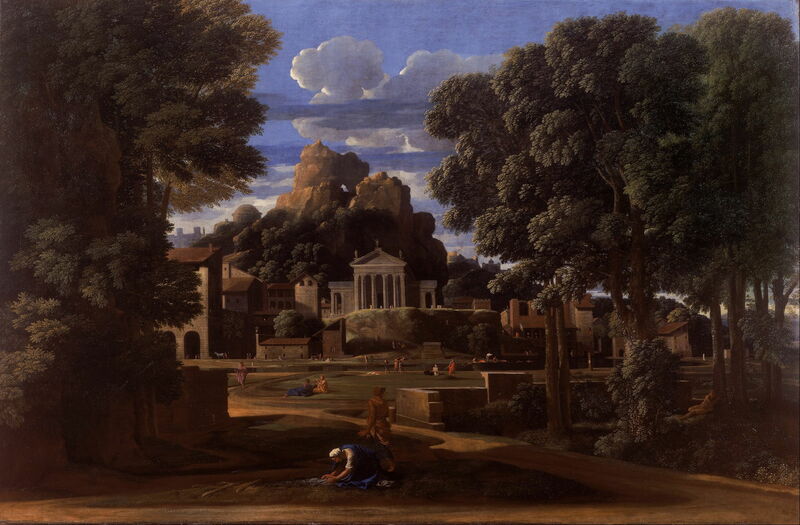 Nicolas Poussin (1594–1665), Landscape with Saint John on Patmos (1640), oil on canvas, 100.3 x 136.4 cm, Art Institute of Chicago, Chicago, IL. Wikimedia Commons. Landscape with Saint John on Patmos (1640) shows another idealised landscape, probably based on the western Italian coast, rather than Patmos in the Dodecanese, in the eastern Aegean. 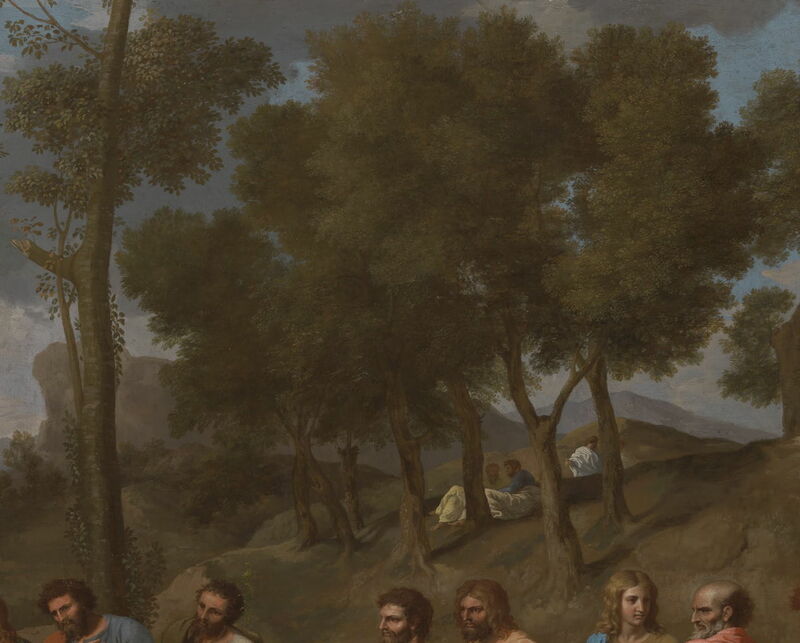 Instead of placing trees at the edges, Poussin sets them further back; again these have the look of oaks. There is a richer variety in the middle distance, breaking the more regular lines of ancient ruins. Nicolas Poussin (1594–1665), Landscape with Saint John on Patmos (detail) (1640), oil on canvas, 100.3 x 136.4 cm, Art Institute of Chicago, Chicago, IL. Wikimedia Commons. A more detailed view of the tree at the left confirms that it has the leaves typical of a member of the oak genus, Quercus, and has bark which is carefully textured and encrusted with lichen. Poussin was no botanist, and understanding of plant and tree species was limited at that time, but his trees reflect careful observation and field drawings. Landscape with the Ashes of Phocion (1648) is dominated by the dense canopies of Holm Oaks, their distinctive leaves painted meticulously. At the far right, there appears to be a close group of poplars, perhaps. Nicolas Poussin (1594–1665), Landscape with the Ashes of Phocion (detail) (1648), oil on canvas, 116.8 x 178.1 cm, Walker Art Gallery, Liverpool. Wikimedia Commons. When seen in detail, their anatomical construction is apparent, as are more figures from his staffage, including a person apparently clinging to the base of one of the trunks, at the lower right of this view. 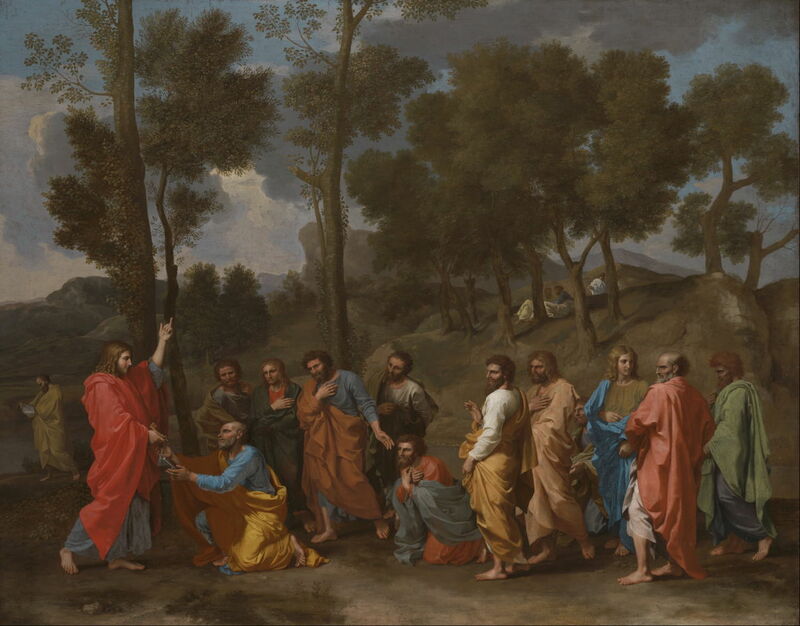 Poussin’s trees were also actors in the narratives in his paintings. 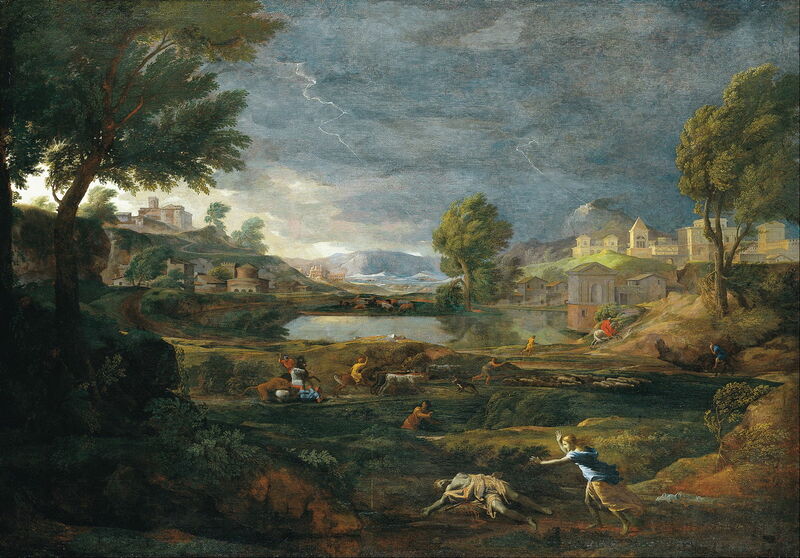 Here, in Landscape (during a Thunderstorm) with Pyramus and Thisbe (1651), each canopy is contorted by the wind, and they form the major cue for its strong gusts, the water on the lake remaining unrealistically flat. Nicolas Poussin (1594–1665), Landscape during a Thunderstorm with Pyramus and Thisbe (detail) (1651), oil on canvas, 192.5 × 273.5 cm, Städel, Frankfurt am Main. Wikimedia Commons. 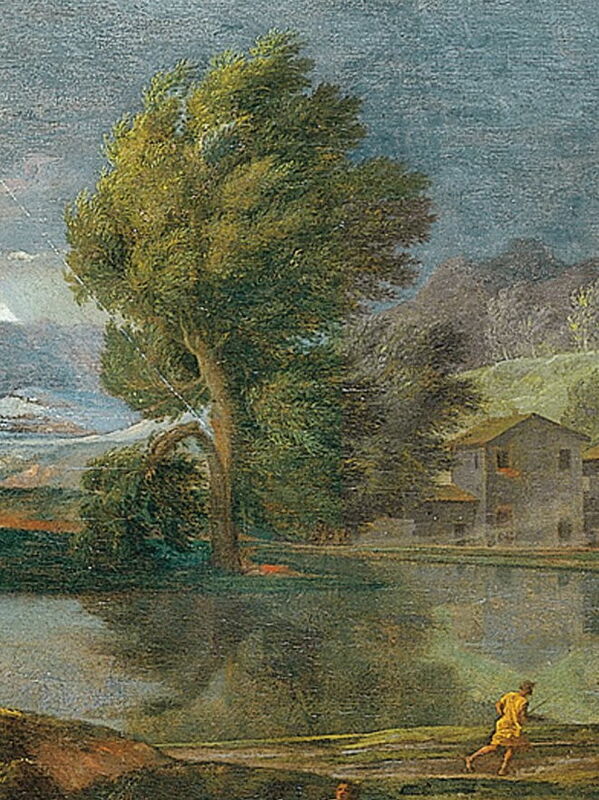 This detail shows the leaves and branches of the tree on the lakeside swept back to their limits, and one of the few branches which appears damaged, to reinforce the impression of the strength of the wind. 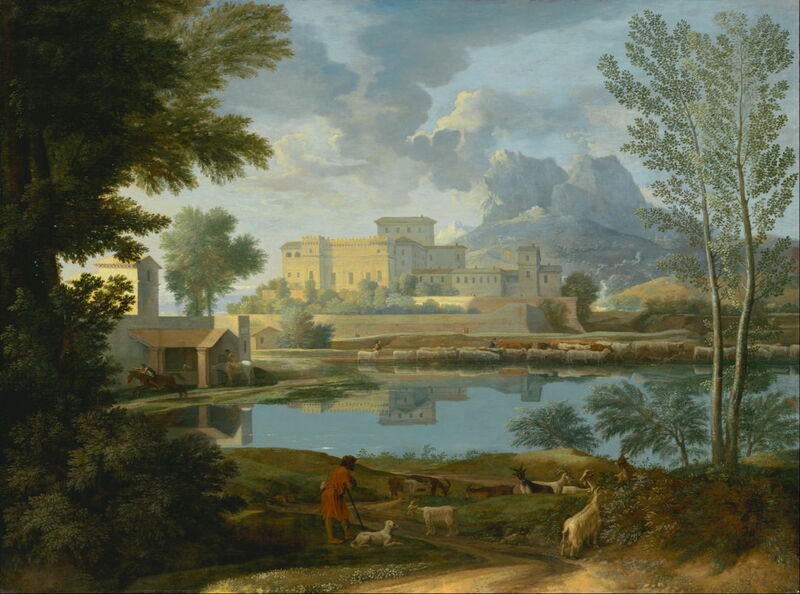 The contrast shown in Landscape with a Calm (c 1651) is achieved largely in the appearance of the foliage and canopies. 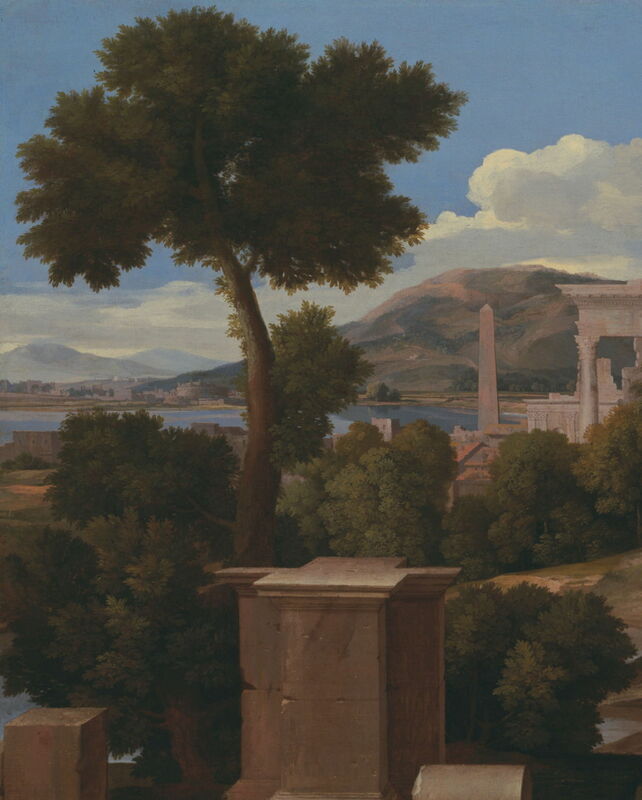 Here the trees are closer to the edges of the canvas, and form a more classical repoussoir. Nicolas Poussin (1594–1665), Landscape with Orion, or Blind Orion Searching for the Rising Sun (1658), oil on canvas, 119.1 × 182.9 cm, Metropolitan Museum of Art, New York, NY. Photo courtesy of the Metropolitan Museum of Art, via Wikimedia Commons. In Blind Orion Searching for the Rising Sun (1658) Poussin’s oaks not only frame the view, but provide scale for the blind giant Orion. Nicolas Poussin (1594–1665), Landscape with Orion, or Blind Orion Searching for the Rising Sun (detail) (1658), oil on canvas, 119.1 × 182.9 cm, Metropolitan Museum of Art, New York, NY. Photo courtesy of the Metropolitan Museum of Art, via Wikimedia Commons. The fused twin trunk is old, its surface gnarled and uneven, and its base clinging on to the edge of a small cliff. 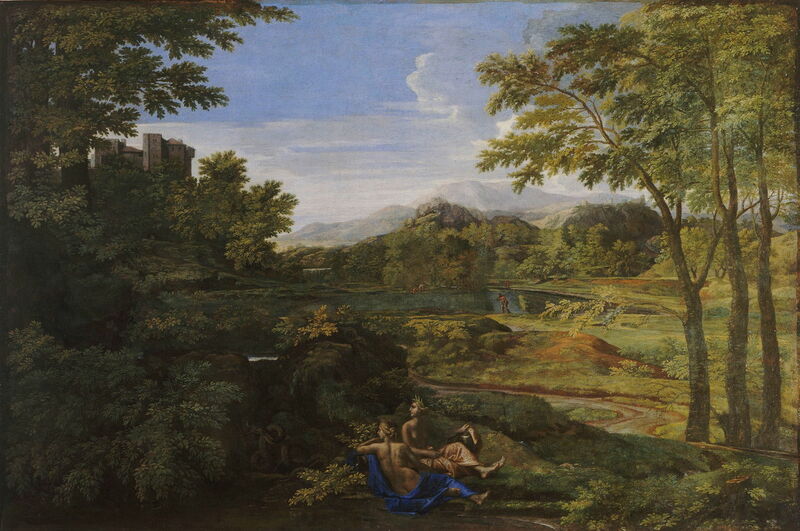 Nicolas Poussin (1594–1665), Paysage avec deux nymphes et un serpent (Landscape with Two Nymphs and a Snake) (c 1659), oil on canvas, 118 x 179 cm, Musée Condé, Chantilly, Oise, France. Wikimedia Commons. 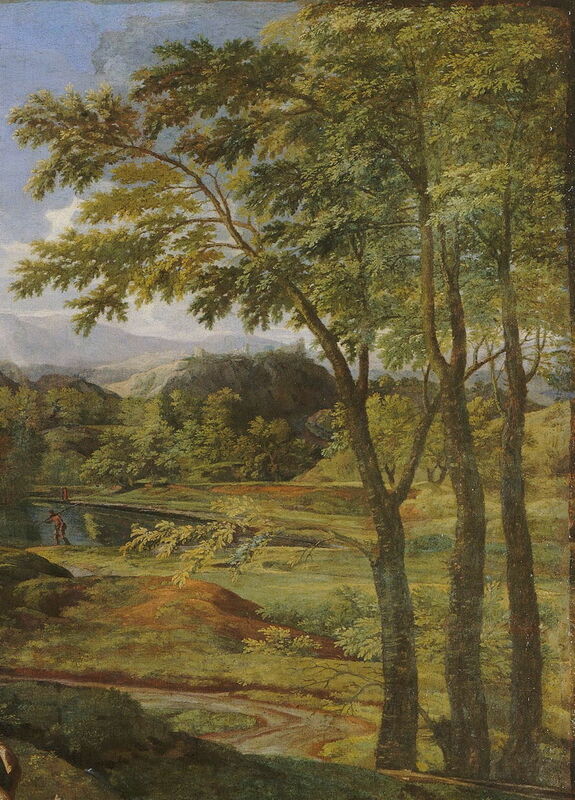 Landscape with Two Nymphs and a Snake (c 1659) uses the trees to the right as more than just a framing device. Nicolas Poussin (1594–1665), Paysage avec deux nymphes et un serpent (Landscape with Two Nymphs and a Snake) (detail) (c 1659), oil on canvas, 118 x 179 cm, Musée Condé, Chantilly, Oise, France. Wikimedia Commons. This detail view confirms the trees at the right to be oaks once more. He again controls level of detail, size of leaves, and ‘focus’ to enhance the sense of depth. 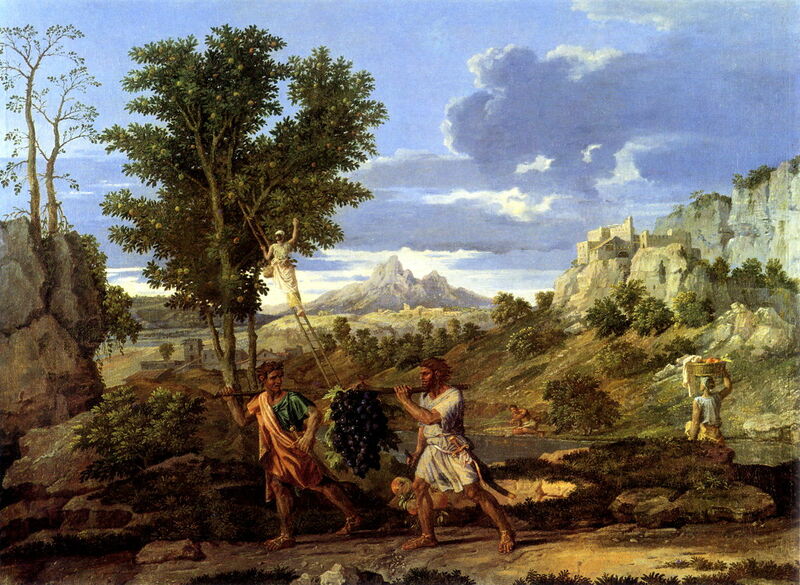 Nicolas Poussin (1594–1665), The Four Seasons: Autumn (1660-4), oil on canvas, 118 x 160 cm, Musée du Louvre, Paris. Wikimedia Commons. His series of the four seasons, painted right at the end of his career and completed shortly before his death, is also rich in trees, particularly in Spring. His Autumn (1660-4) shows a young woman picking fruit from a laden pomegranate tree, with barer trees to their left, poised at the edge of a small cliff. 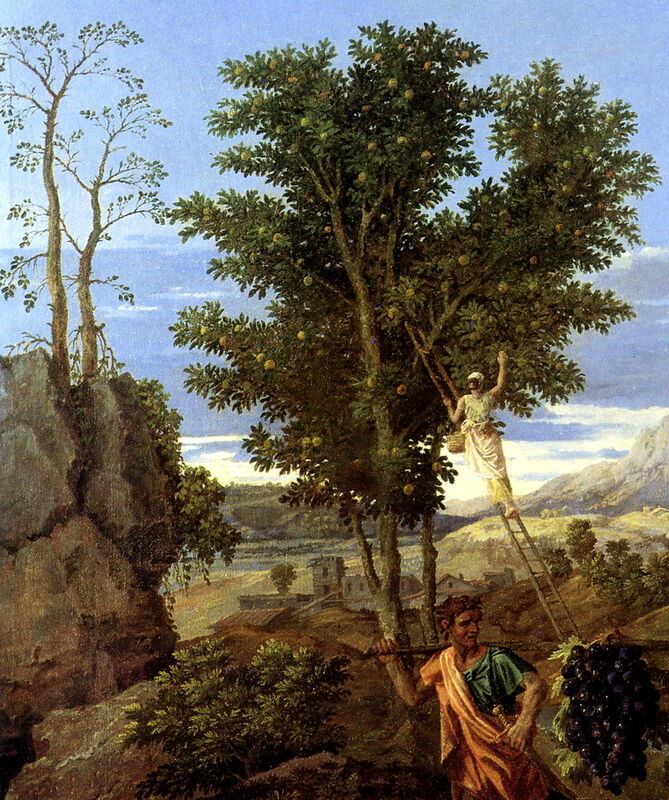 Nicolas Poussin (1594–1665), The Four Seasons: Autumn (detail) (1660-4), oil on canvas, 118 x 160 cm, Musée du Louvre, Paris. Wikimedia Commons. Seen in detail, his careful anatomical construction and painting of each leaf are apparent. 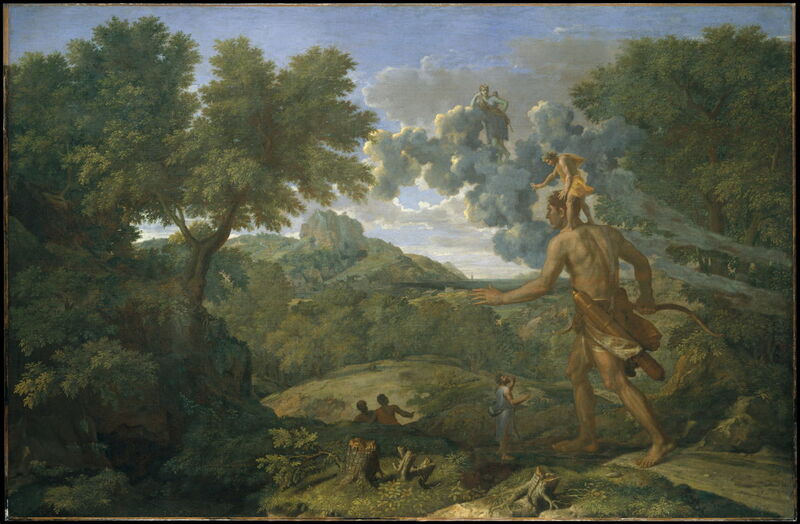 Although most of his landscapes straddled genres and few are dominated by trees, Poussin painted many magnificent trees. His favourites were species of oak, whose leaves he was always careful to distinguish. In contrast to his successors, he seldom painted trees which were overtly damaged – one branch is cracking in the wind in Landscape (during a Thunderstorm) with Pyramus and Thisbe (1651), for example, to emphasise the strength and effect of the gusts – or hulks of old or dead trees. His landscapes were idealised in every respect and aspect. He used gradation in detail to give the impression of depth, effectively defocussing foliage as it receded into the depths of the view. This anticipated similar depth of focus effects in photography by two centuries. Book: Poussin et Dieu (Poussin and God), Milovanovic and Szanto, reviewed on this blog. Clark TJ (2006) The Sight of Death, an Experiment in Art Writing, Yale UP. ISBN 0 300 11726 4. Milovanovic N and Szanto M (eds) (2015) Poussin et Dieu (in French), Hazan. ISBN 978 2 7541 0826 3. Thuillier J (1994) Nicolas Poussin, Flammarion, Paris. ISBN 978 2 08 012440 4. Posted in General, Painting and tagged Claude, focus, landscape, oak, painting, plein air, Poussin, repoussoir, trees. Bookmark the permalink.